I had a spirograph too! I live in Italy, maybe it was not on sale in Italy: I got it as a gift shipped from my aunts from the USA. I really played a lot wth it, I could not understand how this drowings came out but I remember I was trying to understand what happened if I changed the hole for my pen or something else and I played to predict which drawing I could obtain before doing it! Your project is very interesting! Thank you!! Thanks elibio! 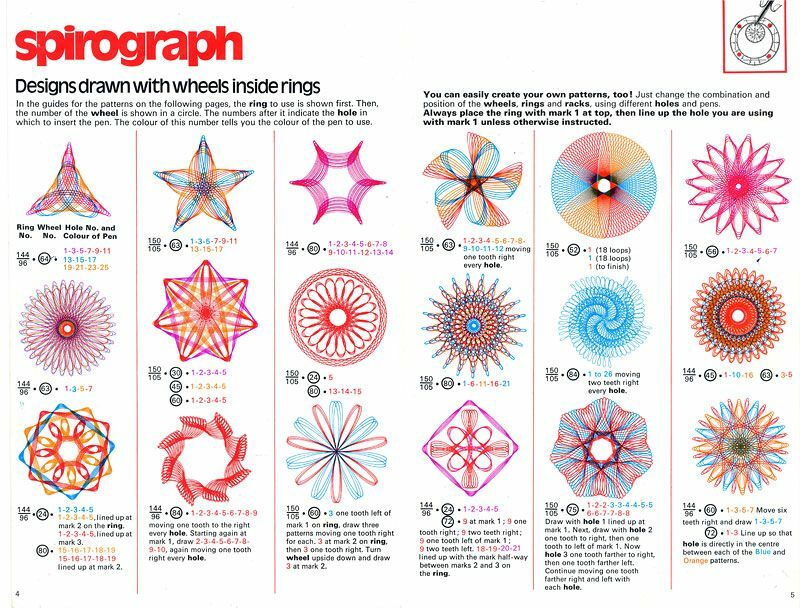 Now I know the English name for this magical tool: spirograph! The one I used to have when I was a child only displayed holes. But the one my friend just got me has many different shapes in the gear. Check out the picture I attached to the previous post. It’s very hard to figure out what would came out before drawing, but that’s the fun part of it: guessing the spiral! I’m gonna play this game with my kids. Thanks for the idea you gave just gave me! My favorite childhood object was my Star Wars sheets. In the mid 70’s, the sheets I put my head on at night served as the backdrop for my dreams, hopes, and ideas about the future. I was convinced the things that seemed impossible, were not. Perhaps wee just needed more people willing to join the “Rebellion.” I began by dreaming, wondering, and maybe stretching my arm as I pretended to use the force. Blocks and pillows & blankets! I got a lot out of my bag of multicolored blocks. They would create buildings, form roads, create a village, be the walls for mazes, create patterns, and experiement with geometric designs. The pillows and blankets created may “houses, caves, or forts” with unique niches inside and out for different tasks. Our poor living room probably looked a disaster to my mom, but it was fantastically to me and my stuffed animals! My childhood object was not an object at all, but a place, the woods. I spent from sun up to sun down out in nature exploring the woods, river walking, collecting leaves in the fall, rocks in the summer, wild raspberries and strawberries and creating cool places to play. I spent the seemingly endless summer days climbing trees, swimming in the pond, hiking around the fields and woods that surrounded my house. My brother, sisters and I invented games to play, new places to explore and even designed an entire outdoor house complete with a doorbell made out of a branch from a Maple Tree. I wouldn’t trade the things that I experienced spending so much time outside as a child. I love technology, but there really is nothing like unplugging, going outside and experiencing the Master’s design of the natural world; my lifelong kindergarten. When I look back at my childhood days I rediscover myself as various role-players!! To be completely honest, I was somewhat an imaginative kid. I’d love to riding Bi-cycle. I also enjoyed reading books. Yes, I really miss being a kid♥!! The train had a remote control, so, sometimes I played “analogicaly” but some others, I played with the remote control. And it was amaaaaaaaazing! It was like having the control of the world! Hahahahaha! The train was called “Rolyal Exprees” and I have searched an searched but never find it again. Oh nice. These little soldiers are cute enough for even girls to like. Lovely description of the experience. As children we did these things, used our brothers’ toys to make things, but this description of the pleasure is something I wouldn’t have been able to drag out of my memory bank. My parents still have this set in their house from when I was kid. My kids play with it now. I clearly remember putting it together and having some epic battles between the knights. “I love technology, but there really is nothing like unplugging, going outside and experiencing the Master’s design of the natural world; my lifelong kindergarten.” ~ well-said! Yes, we need technology, but eventually nature is our life-long kindergarten. We have a lot of things to learn from the nature. Jigsaw Puzzles (unframed) were also one of my favourite things to do as a child. I loved the satisfaction of getting pieces to fit, and became very good at recognising shapes, and developing finer spacial awareness. It became a bit of a game to only pick up a piece from the box, if I knew where it went in the puzzle. Snake Eyes and Stormshadow were heroes of my youth! I never went so far as switching their faces, although I was fascinated with the way their limbs were connected. The childhood object I choose is the playmobile. I was not so into lego but more into playmobil. You had a limitation what you could customize but this way you could more focus on your imagination instead of building. If I think back to the childhood objects that really interested me it was just about anything I could build with. From Lincoln Logs to legos to those awesome strips of MatchBox Car tracks. I was intrigued with how things went together and how different combinations produced different results. Although I did not go into any sort of construction or engineering (I’m an educator) I’m fascinated by systems. I like looking at the pieces and trying to figure out the best way to put them together. Now I’m not looking for a way to make the cars go faster down the track, the logs stack to make a floor and second level but a way to make sure we communicate better with families, registration for conferences runs smoother, students connect with classrooms around the world and most importantly, learn and still have fun. My childhood object is actually a book. I unfortunately do not remember it’s name but in my memory it was a sort of pamphlet format, with mat gray and pink in the cover. I remember learning about binary numbers and automata. I spent lots of play time working through automata using pen and paper. It’s so unfortunate that my memory of this object is so fuzzy because the video this week really inspired me to get back in touch with my former self. I can only hope that perhaps, in spite of various moves around the country and actually internationally on my part, some of my stuff is still around and I’ll be able to connect with it on an upcoming trip. I don’t remember a specific childhood object that I played a lot with, I spent a lot of my time reading books, and that took up much of my time and imagination. My family though, played a lot of card games, and that became a big thing that my family would do together. We would often play on Sunday nights and would amass new decks of cards on family vacations. Eventually we had a large tupperware container filled with random decks of cards that had missing parts and were very worn. My brother and I would often take this container and use the card to build giant card houses. Not the ones you typically see with a giant pyramid with cards stacked one on the other. Our card houses became these circular constructions with hallways and additions, that would end up taking over our whole living room. We would create elaborate villages and invent stories about the people living in them, and sadly in the end a terrible monster would stomp through and destroy the village and we would have to start again. I don’t think I have any pictures of this available, but I still make them from time to time. I think because it wasn’t a specific toy it allowed me to be more creative because the houses that my brother and I built were anything we wanted them to be. There was also a lot of trial and error because we often attempted to change the standard design we had created, but many of the time the structure wasn’t stable anymore. Thinking back over my childhood, playing with a simple deck of cards showed me the importance of trial and error, of how objects can be manipulated into other things, and the importance of working with a teammate who is passionate and driven as you are.